The Walmart Foundation funded a 5 kW solar electricity project at the in Shoreline, Washington just outside of Seattle. 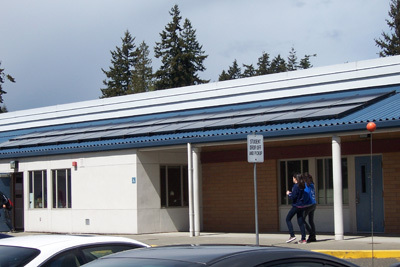 The solar panels are visible to anyone visiting the school because they are on a slanted first story roof near the front entrance to the school. They are in fact directly above the student drop off location. There will be a teacher training workshop held at Shoreline Community College this Fall, but the teaching has already begun. Their live data feed showing how much electricity is being generated will be on line this week. The school now has a solar cooker and food cooked by the sun is coming to their classrooms. A Shoreline Community College graduate has a company that did the installation and current students of Shoreline Community College helped with the installation. The students in one class even dressed in bow ties like their idol Bill Nye the Science Guy and every one of them wrote a little something below stating why they thought this solar school project was important to them and/or their school. Cristi Camp is the teacher who organized it and her story is also included below. The solar celebration is May 27th at the school at 1:30. 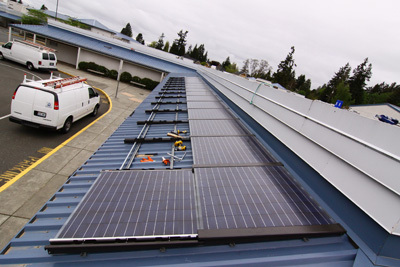 May, 5, 2010 is the first operating day for Einstein Middle School’s new solar photovoltaic (PV) system. It is perfect timing as the 7th grade students have just finished the ecology unit and have begun to learn about energy transformations. They will learn about technologies that harness energy, including solar PV systems, and will also learn of the environmental and economic impacts of both non-renewable and renewable sources and have to evaluate the benefits and risks of these energy solutions. It is exciting to witness the interest of our students grow in the realm of environmental science. The solar PV system installed on our school brings home the reality of the cultural shift towards an environmentally responsible society that our students are apart of and will ultimately lead in the future. The perspectives of our Einstein students are presented below, directly from the students themselves – such a thoughtful group of kids – I hope you read them all! 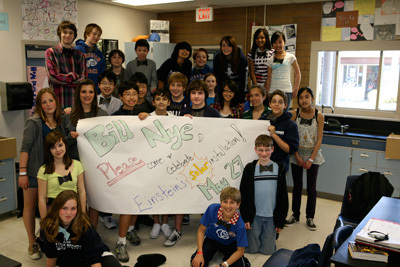 This entry was posted on Tuesday, May 18th, 2010 at 1:39 pm and is filed under Solar Schools, Walmart Foundation . You can follow any responses to this entry through the RSS 2.0 feed. You can leave a response, or trackback from your own site.